With a date set for a union-representation election, Comptroller General David Walker, the Government Accountability Office’s top official, said it’s time for the agency to focus on the future. Once the union matter is decided Sept. 19, Walker said, GAO will be able to get back to the business of serving as Congress’ investigative arm. GAO executives and the International Federation of Professional and Technical Engineers (IFPTE) reached an accord last month that paved the way for GAO’s analysts to vote on whether they want to unionize and be represented by IFPTE. In recent months, GAO’s senior executives and Walker, a strenuous advocate of government workforce changes, have been involved in negotiations for conducting a union-representation election. A sticking point was the eligibility of 461 analysts to vote in the election. 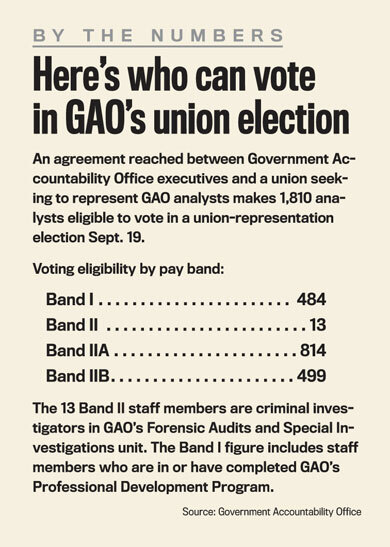 The analysts are part of GAO’s Band IIB pay band, and GAO executives contended that they are supervisors and therefore ineligible for union representation under labor laws. The stalemate was resolved when GAO executives agreed not to contest the Band IIB analysts’ eligibility, even though they still believe that “the overwhelming majority…would be deemed to be supervisors,” Walker said. At the same time, IFPTE officials accepted GAO’s proposal to let entry-level employees who are in the agency’s Professional Development Program vote in the election, he said. There are nearly 500 staff members in that category, according to GAO figures. “The ultimate effect is that we’re maximizing the number of people who will have the opportunity to vote,” Walker said. More than 1,800 employees will be eligible to vote in the election. To prepare for the case, GAO’s executives hired Venable LLP, a Washington law firm, to represent them. The agency’s leaders said GAO’s staff attorneys didn’t have enough direct experience in labor relations. The move drew strong criticism from Democrats in Congress. “It is uncommon for a federal agency to hire private-sector counsel for such purposes,” said Rep. Debbie Wasserman Schultz (D-Fla.) in a House floor debate on legislative branch appropriations for fiscal 2008. She said the action was unnecessarily costly. Meanwhile, GAO’s pro-union employees are preparing for the September election by distributing literature and staging a series of forums for GAO workers, including a recent event for Professional Development Program employees, said Steve Berke, a senior analyst at GAO. He said it remains to be seen how many staff members in the program will vote in the election. Pro-union analysts share a concern with union officials that those employees might be less inclined to favor union representation than other analysts.